We waited until dusk and took several samples with the two phones. There are a couple of outside shots taken with Night mode on, but we also took multiple photos of our ISO chart with Night mode off and on and with flash too. We picked out the best and the worst of these to get an idea of how reliable each phone is in these conditions. We tested low-light video recording as well. First, let's look at the outside photos. HTC is boasting a faster, F/2.0 aperture, huge pixels and optical stabilization, all of which should result in great low-light shooting capabilities. The Samsung Galaxy S4 has an F/2.2 aperture, regular-sized pixels and no stabilization. Surprisingly though, we found the Samsung smartphone produces the better photos. They are brighter and with actual detail too. There's very little noise and the high resolution means there's plenty of detail. Colors are not perfect, but the photos are very good overall. The HTC One snaps photos in night mode faster than the Galaxy S4, but they are dark, noisy and there's not a lot of fine detail to be had. On the up side, colors are more accurate. Update, May 8: We took new shots after the update, these were taken in auto mode. HTC One images look sharper, but due to the lower resolution some of the fine detail escaped its camera. The Galaxy S4 did manage to capture more detail, but its images suffer more from noise and have lower contrast. Interestingly, both phones shot at about the same shutter speed, even though the S4 doesn't have OIS to reduce blurring from camera shake. Here are the full resolution shots we took for this comparison. As with the Galaxy S III, the Galaxy S4 camera benefits from having its Night mode enabled - the noise levels are significantly lower and the motion blur is reduced (we're guessing shorter shutter speeds, but the Galaxy S4 doesn't record EXIF info in Night mode). The HTC One meanwhile showed virtually no difference in image quality with Night mode off or on. It is a lot more consistent than the Galaxy - the best and worst shots taken with the HTC One are very close in terms of detail, while with the Galaxy S4 you have to snap several photos to make sure you have a good one. Update, May 10: We took new shots after the software update. The Galaxy S4 still benefits greatly from Night mode - in the dark you should have it either on Night mode for scenes with distant, static objects (this mode disables the flash) or turn on the flash for closer shots. 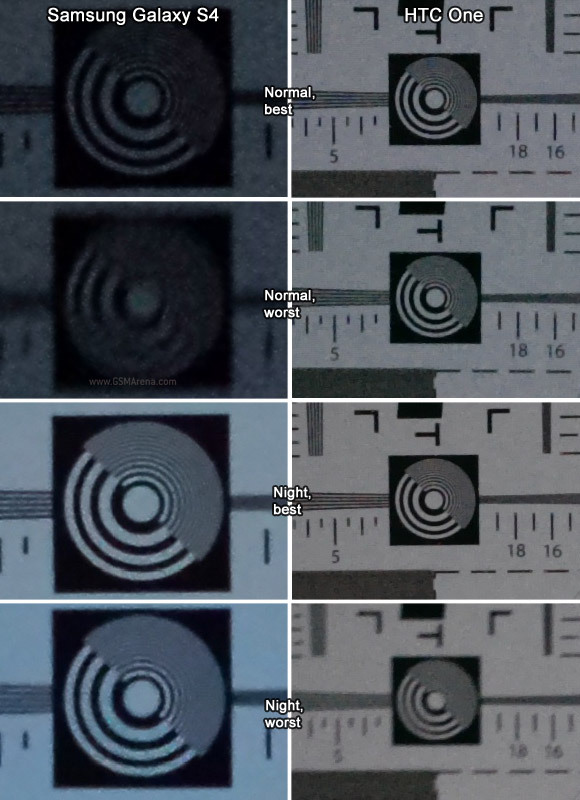 The difference between the best and the worst shot of the S4 has gotten smaller, which is great - it means you have to take fewer shots to make sure you have a good one (it's still a good idea to take at least a couple). The HTC One does light post processing for Night mode shots, which cleans up the noise and brightens up the image slightly. However, this mode slows down the shutter speed and even the OIS couldn't rescue it at times. Night mode is good for static shots, but for moving objects you need the flash. Both phones managed pretty good image quality - the HTC One offers better per-pixel quality, but if you downscale the Galaxy S4 shots you'd get similar image quality. We also tried out the LED flash on both the Galaxy S4 and HTC One. Note that both phones disable flash in Night mode, so we shot in auto with forced flash. Once again, the HTC One photos are more consistent, while the S4 turned in some good and some bad shots. But the S4's higher resolution ultimately means its good shots are better than what the One can manage. We took a step back (the distance to the chart was about 2m / 6') and snapped more photos. 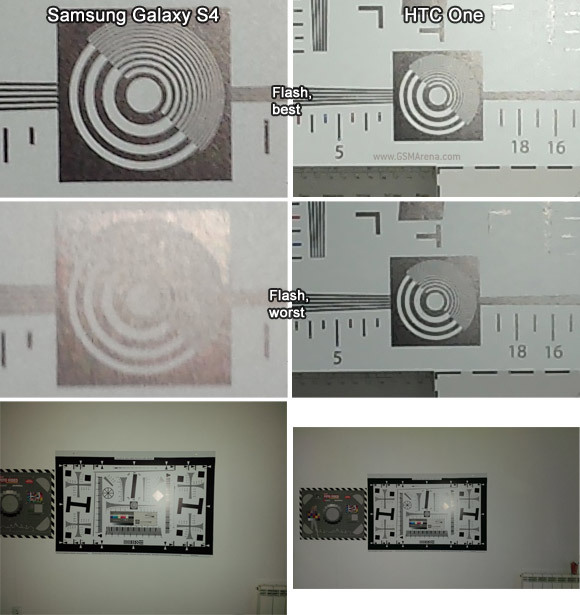 The HTC One flash seems to light the scene more evenly, while the Galaxy S4 caused vignetting, meaning you should probably be closer than 2m / 6' when shooting with the Samsung smartphone. Update, May 10: We redid the flash tests, but nothing has changed really. Update, May 10: You can have a peek at the full resolution shots of the chart too. 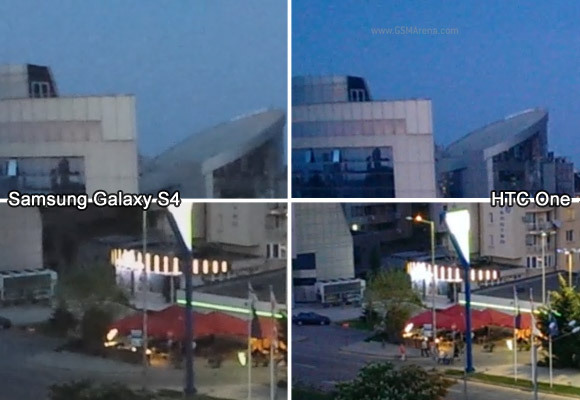 We recorded sample videos too - the Samsung Galaxy S4 again offered better exposed image and slightly more detail. The difference isn't huge, but considering how close these two were in daylight we didn't expect anything else. Update, May 8: The HTC One has a definite advantage here - the videos have more detail and more color (even if it is oversaturated). The Galaxy S4 videos have low contrast and most of the fine detail is smudged out. The OIS once again proves quite nice, though. Anyway, here are the two video samples, which we used to make the crop above. 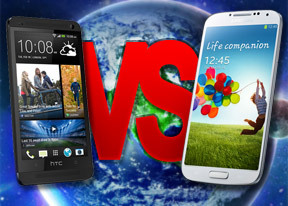 Winner: Samsung Galaxy S4. Surprisingly, the Samsung Galaxy S4 has the better low-light camera performance. You'll have to snap several photos to make sure you have a good one, but the end result will be better than what the HTC One produces. The Galaxy S4 has a slight advantage in low-light video too. The HTC One is more reliable - thanks to its OIS you can snap just one photo and know it will be about as good as it gets. But the camera's performance is simply nothing to write home about, and there are cases when OIS just isn't helping at all (when shooting moving subjects).